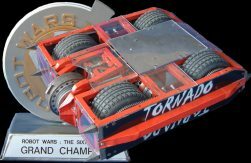 These pages contains all of the robot images on the Tornado website, and as such each will take a long time to load. All the images can be found around the site, e.g. in our diary or our event reports, along with more complete explainatory text. The images are in chronological order, oldest first.